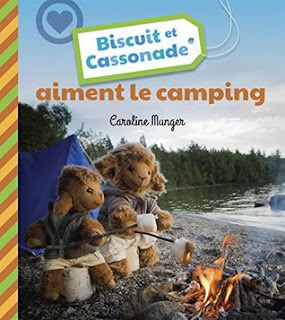 Il y a longtemps que Biscuit et Cassonade rêvent de faire du camping. Les deux complices ont très hâte d’installer eux-mêmes leur tente, de se promener dans les bois et, surtout, de faire griller des guimauves sur le feu! Biscuit et Cassonade aimeront-ils la vie en pleine nature et qui rencontreront-ils durant cette aventure? Boy, is my French rusty! I got some French picture books from the library because I thought they'd be something I could read. After all, I was reading French-language novels in high school and university. But it's been a while. I got the gist, I think, but I don't think I'm really going to be able to comment on the quality of the writing. One thing that I don't like about the way French is written is dialogue. There's often little punctuation to set it off, so I was a bit confused as to when the characters were talking and when they were simply performing actions. It's tricky for an English speaker to get the hang of. Anyway, the story itself (what I got of it) isn't bad. Biscuit and Cassonade are brothers. There's apparently a whole series of books about them, but in this installment, they go camping. They pack up all their stuff and head out into the woods. There's definitely a nice element of teaching all about the objects that are involved in camping. The brothers have dinner (and a dessert of marshmallows--of course!) and retire to their tent. In the morning, they find a greedy raccoon sprawled out near their campsite among the remains of their food. The raccoon becomes their friend and helps them take advantage of their outdoor surroundings. They all go boating and enjoy the scenery. What makes this book cute are the photographic illustrations. All the characters are stuffed animals that are posed with various props. It looks like the toys were actually taken out to some campsite by a lake to get the shots. It's pretty cute. When the raccoon appeared in his food coma, I actually laughed out loud. The photographer managed to create some pretty fun characters out of stuffed toys. I wouldn't mind checking out some of the other books about these fuzzy brothers. I'll have to see if the library has any more of their adventures. This is a book about the (apparently) famous 1901 race in which Henry Ford unseated the reigning American car-racing champion, won some money, and used it to start the Ford Motor Company. As a Step into Reading title, it has more of the format of a chapter book (without the chapters) than a picture book. 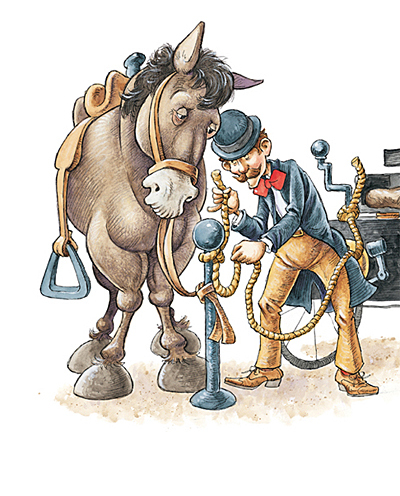 But the illustrations are still pretty good and help to tell the story quite well. The main strength of the book, however, is the writing. It's clean, uncluttered, and offers the facts without too much embellishment. 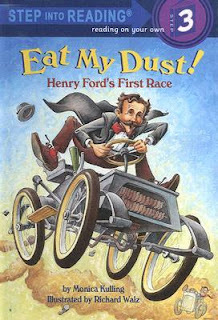 I'd recommend this book to kids who are interested in history or cars (or the history of cars). It's an interesting look at a real event that helped shape the transportation industry. so it would not roll away. 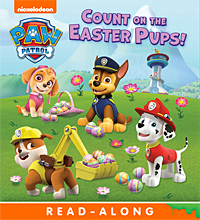 by Spin Master PAW Productions Inc.
A glittery Easter board book starring Nickelodeon's PAW Patrol! Help Skye, Chase, Marshall, and the rest of Adventure Bay's amazing pups get ready for Easter while learning to count from one to ten. Girls and boys ages 3 to 7 who love Nickelodeon's PAW Patrol will thrill to this board book. This book is, surprisingly, not terrible. For what is essentially a counting book, it's not bad at all. The writing is fairly strong, the pictures are appealing, and the objects to be counted are quite clear. My only caveat would be that you should probably be familiar with PAW Patrol to get the most out of this. I'm still not clear on all of the characters. (Who's Ryder? The human boy? Or one of the dogs?) Aside from that, though, this is a fun little counting book with an Easter theme for young children. Keywords: children, Count on the Easter Pups!, counting, Easter, holiday, picture book, review, Spin Master PAW Productions Inc.
Review - Stink It Up! They don’t call him Stink for nothing! 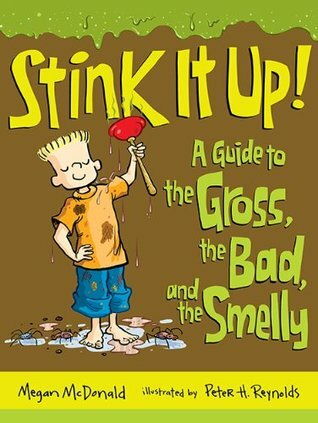 Now kids can savor a smorgasbord of facts about smelly and vile stuff in honor of their favorite super sniffer. Did you know that a group of skunks is called a stench? (No lie!) 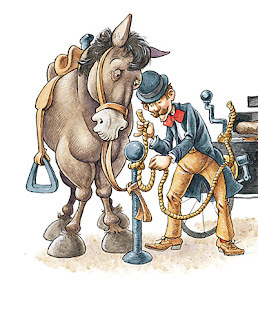 Can you believe that in colonial days, window-washing rags were dipped in pee? Or that snail slime was once an ingredient in cough syrup? Stink has a nose for yuck and muck, and this book is full of it: moose poop festivals, mouse brain toothpaste, maggot cheese, and way more. Its pages are crawling with more than two hundred facts, quizzes, recipes, and bits of trivia about things that are gross, bad, and smelly. P.U.! When I picked up this book, I didn't realize that this Stink person is a character from the Judy Moody books. That doesn't really matter for most of the book, which is mainly non-fiction (aside from a seemingly pointless quiz about the fictional series of books). As non-fiction, though, it kind of fails. I came across numerous errors or exaggerations, and I can't get behind a children's book that doesn't do its research. It wasn't even difficult research to do. On more than one occasion, I was so skeptical of the book's claims that I Googled them. And, what do you know? The book was wrong. A vomitorium was not a place where Romans used to vomit. Thomas Crapper did not invent the flush toilet. How many other mistakes are in this book? It obviously wasn't fact-checked. I'm also not a fan of the way the book encourages kids to pull pranks. In one, they have you emptying out half a tube of toothpaste (which is terribly wasteful) and replacing it with chocolate pudding. Have you ever heard the expression about putting toothpaste back into a tube? It's a saying for a reason! (Basically, good luck trying to get chocolate pudding into that tube.) Other pranks have kids putting whipped cream on other people's property (potentially damaging it) or painting their siblings' faces while they sleep. I just don't think these things are appropriate, and I certainly wouldn't want to encourage this type of behaviour. The book is full of all sorts of gross facts. They're even grosser if you're a vegan. It's absolutely amazing how many ways humans have come up with to exploit, abuse, and murder animals. The more disgusting the better! The explanation of jellied moose nose has a drawing of a moose with a bandage where its nose used to be; that's neither funny nor respectful. I wasn't impressed with this. I know there are lots of books out there for kids about disgusting stuff. I'll have to give one of them a try... because this one was a bust. Keywords: children, Megan McDonald, non-fiction, Peter H. Reynolds, picture book, review, Stink, Stink It Up! Celebrations and festivals include: Mga Kaarawan—Birthdays Semana Santa—Holy Week Mga Barrio Fiestas—Town Festivals Mga Binyag—Baptisms Araw ng Kalayaan—Independence Day and more! One of my best friends in high school was originally from the Philippines, but she never really talked about any of her traditions or celebrations. I figured I might find this book interesting, and I wanted to learn something. Unfortunately, pretty much all I learned is that the Philippines has been the victim of religious and cultural oppression, first by the Spanish and the Church, and then by the Americans. I was surprised at how little actual Filipino culture is left. Almost all celebrations are based on Catholic precursors. Ones that aren't borrow heavily from other cultures (such as the Chinese). Does the Philippines really have no history of its own? That's what this book makes it seem like... and I find that really sad. I was turned off early on by the festival where they make the water buffalo walk on their knees to worship saints, and even more so by dressing the dead pig up in sunglasses. Animal cruelty may be a part of certain cultural celebrations, but that doesn't mean I have to like it. It seems awfully disrespectful, but none of that is addressed; it's taken for granted that this is how you treat animals for these celebrations. I guess I was hoping for something a little more... no, less Western. 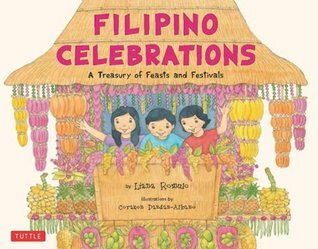 Aside from the names of the objects, celebrations, and rituals in Filipino languages, this book basically showcases Western traditions. That may be how the Philippines is today, but I'm still disappointed that so much of their history has been lost to colonial oppressors and their celebrations. Jocelyn loves socks. She wears them everywhere... even in the bathtub! When a box of socks depicting different emotions arrives in the mail from her grandparents, she is ecstatic. After tearing open the package, she decides to wear a different pair of socks for when she's happy, when she's sad, and everything in between. 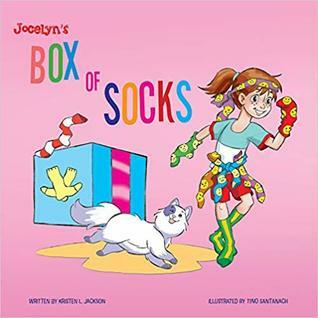 Jocelyn soon discovers that her beloved new socks are not as exciting as they seem and are weighing her down. Can she learn how to manage her feelings and mix and match her socks to fit her every mood? Complete with a teacher's guide ideal for parents and educators. I've said before that I love it when picture books teach me things. However, there's one thing I really don't like: when picture books try to teach me things. This book is an extremely transparent attempt at teaching a lesson about feelings, making it suitable mainly for very young children. It doesn't help that the main character is drawn looking like she's about eight years old; shouldn't kids be able to identify emotions by that point? The illustrations are kind of cute, quite cartoonish and colourful, and it's fun seeing all the socks. But I don't know why her parents are drawn like they just stepped out of the '60s. That's kind of odd. Overall, I'd probably only recommend this one to parents of very young children. If the illustrations had made Jocelyn look a bit younger, I might not be struggling with this one as much as I am; I just keep wondering what's wrong with her that she doesn't know the basics at her age. I also wonder if preschoolers will be able to relate to a "big kid". Thank you to NetGalley and Schiffer Publishing for providing a digital ARC. Is this the year you'll be able to catch the Easter bunny in action? 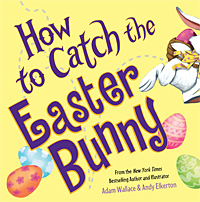 Start an Easter tradition with this fun and funny children's book, from the New York Times bestselling creators of How to Catch a Leprechaun! "I've been working long and hard with all my peeps and crew. We've made the eggs, and now I'm here to bring them all to you!" I don't like these books about trying to catch mythological creatures. (I had similar issues with How to Trap a Leprechaun by Sue Fliess and Emma Randall.) It's basically encouraging kidnapping, which I don't think is all that healthy a thing to be teaching. Okay, the rhyme scheme in this one is okay and the pictures are passable... but I just can't wrap my brain around the Easter Bunny suggesting all kinds of ways to trap him. How is that any different from a book with a deer talking about how you could hunt him down? or a trap upon the ground. then it's me who made that sound." I wasn't impressed. Maybe I should've known better going into this book what I was going to get. Still, I didn't expect the quarry to be giving the suggestions. That's just weird. Review - I Want a Sister! Review - I Want a Friend! Review - I Want Two Birthdays! Review - Fancy Nancy: Stellar Stargazer! 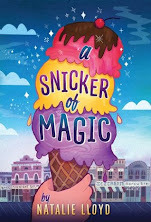 Review - Fancy Nancy: Poet Extraordinaire! Review - Who Stole the Hazelnuts? Review - Fancy Nancy: Explorer Extraordinaire! Review - Penguins, Penguins, Everywhere! Review - I Want a Bedtime Story!